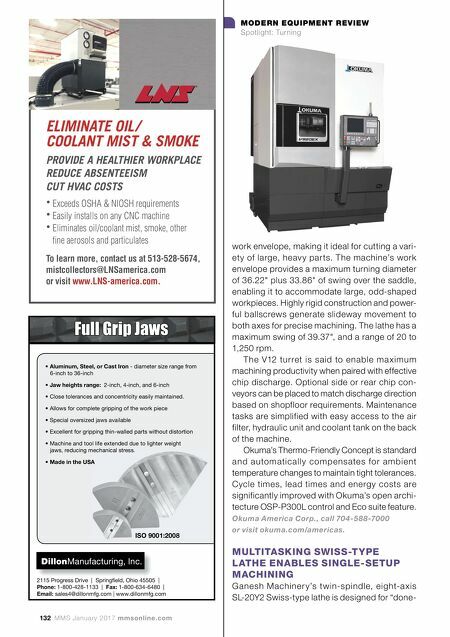 mmsonline.com January 2017 MMS 133 MODERN EQUIPMENT REVIEW Spotlight: Turning in-one" machining to complete the work without follow-up operations that require fixtures and tie up multiple machines and operators. According to the company, it is capable of performing mul- tiple operations on barstock as large as 0.75" in diameter with all axial and radial milling features accurately timed and deburred. 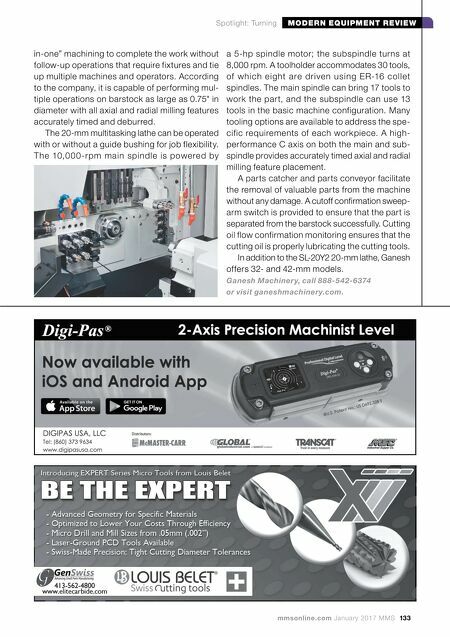 The 20-mm multitasking lathe can be operated with or without a guide bushing for job flexibility. The 10,0 0 0 -rpm main spindle is powered by a 5-hp spindle motor; the subspindle turns at 8,000 rpm. A toolholder accommodates 30 tools, of which eight are driven using ER-16 collet spindles. The main spindle can bring 17 tools to work the par t, and the subspindle can use 13 tools in the basic machine configuration. Many tooling options are available to address the spe- cific requirements of each workpiece. A high- performance C axis on both the main and sub- spindle provides accurately timed axial and radial milling feature placement. A parts catcher and parts conveyor facilitate the removal of valuable parts from the machine without any damage. A cutoff confirmation sweep- arm switch is provided to ensure that the part is separated from the barstock successfully. Cutting oil flow confirmation monitoring ensures that the cutting oil is properly lubricating the cutting tools. In addition to the SL-20Y2 20-mm lathe, Ganesh offers 32- and 42-mm models. Ganesh Machinery, call 888-542-6374 or visit ganeshmachinery.com.